My paper, stickers, and rub-ons are Melissa Frances. I used my Spellbinder Nestabilities to cut the pink scalloped circle and then used glitter glue to sparkle things up a bit. My flowers, pearls, and lace are from the Love Kit by A Kiss On The Chic. This LO was made from my A Kiss On The Chic kit. 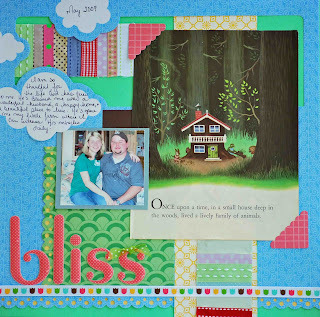 It is loaded with Heidi Swapp paper that I adore! Are you ready for Father's Day? Well if you aren't, Cuttlebug Challenge is going to help! 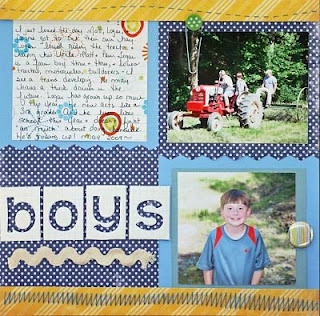 This week's BE INSPIRED WEDNESDAY challenge is to make a masculine card/LO/altered project and emboss on cardboard/grungeboard using your Cuttlebug. This project was really fun. I used Rusty Pickle, Colorbok, and cardboard. I embossed the cardboard with my Cuttlebug and the Swiss Dots folder. 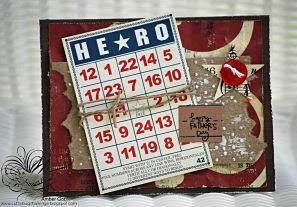 I then painted over my embossing with Tim Holtz crackle paint. I added a Jenni Bowlin bingo tag and Melissa Frances rub-on. 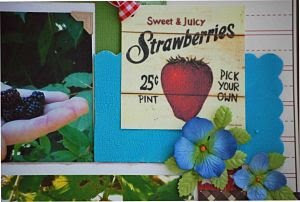 Be sure to stop by Cuttlebug Challenge and take a look at the DT's amazing creations! 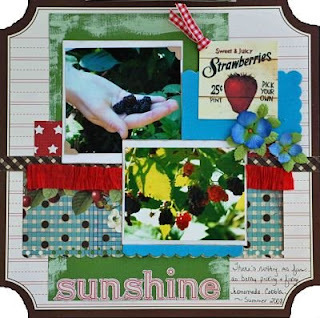 This week's Monday challenge at Christian PaperCrafts Magazine is to scrapbook a blessing + paint on your LO. I had so much fun with this LO! I used my new A Kiss On The Chic summer kit. 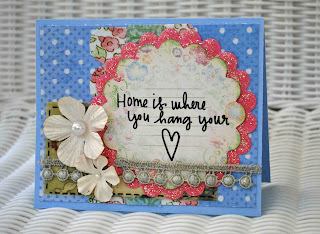 And I also used Tim Holtz crackle paint for the first time and adore the stuff! It really does crackle, amazing! Any Twilight fan knows that apples are connected to the book/movie. So I used a chipboard apple from Oriental Trading as the base of my card. Then I used Colorbok paper and my Cuttlebug with the Swiss Dots folder. I sanded my embossing. I used a Melissa Frances rub-on and Prima bling. This little card was fun and easy. Go check out the amazing DT's projects for the week at CBC. And don't forget to use your favorite movie as your theme + Cuttlebug. This week's sponsor is Vintage Plum, so be sure to play along for a chance at an awesome prize. I just love sewing on LO's. 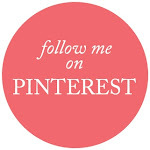 I think it addes so much character and a personal touch to your pages. I wanted my sewing to look messy, like something a little boy would approve of. 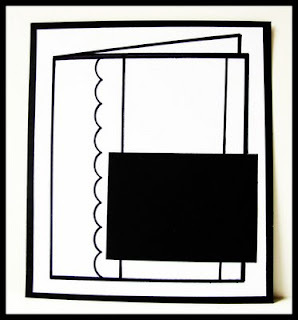 If you are a cardmaker, you've probably heard of 2 Sketches 4 You *link to your right*. They are having the 1st annual Ultimate Card Showdown. And an amazing prize to give away to the winner! So of course I had to throw my hat into the ring! 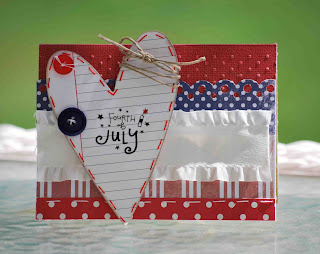 I started out doing a baby card and voila it turned into a 4th of July card. That's the beauty of crafting, you can make ANYTHING. 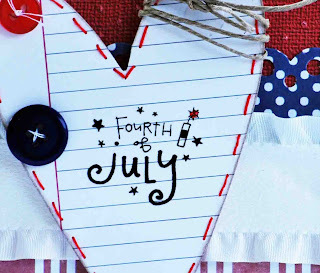 I flipped the sketch and used Marks Paper Co, Melissa Frances, and Jenni Bowlin paper. I used a Jenni Bowlin die-cut and Melissa Frances rub-ons. Plus some Martha Stewart ink and my Cuttlebug with the Swiss Dots Folder. All of the sewing is handstitched. 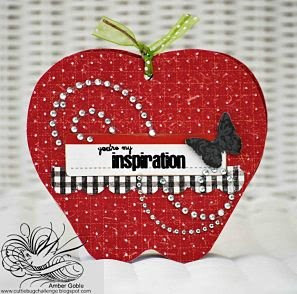 Ready for another inspiring idea from Cuttlebug Challenge? This week's challenge is to use products from Basic Grey + Cuttlebug. My paper is from the Basic Grey "Bittersweet" line. 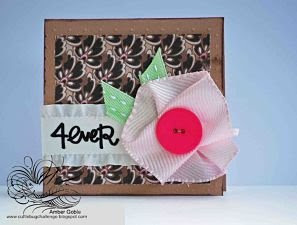 I then added a Melissa Frances rub-on, and embossed my Colorbok cardstock with my Cuttlebug and the Swiss Dots folder. And guess what, my flower is homemade! 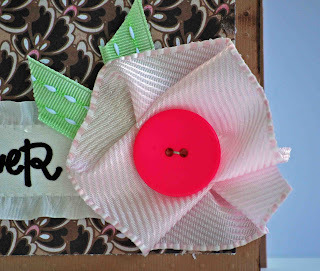 I just started folding some Martha Stewart ribbon (that I actually bought in the Christmas supplies last year) and stitched the button to the center. I then folded a piece of green MS ribbon to look like leaves. So easy and cheap! Don't forget this week's challenge, use Basic Grey products + Cuttlebug. And be sure to check out the DT's amazing work at Cuttlebug Challenge. 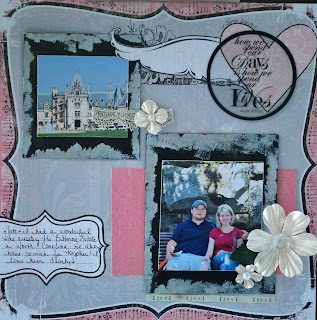 My supplies are from the May kits at A Kiss On The Chic. And I have some exciting scrapping news! I'm being published in the June/July copy of Ready, Set, Create ezine. This is my first time being published in anything so I'm really excited! My creation I'm having published is an altered wall hanging. You know I don't like submitting work to magazines, I don't take rejection well;) So guess what, Maggie from Cuttlebug Challenge (she's our amazing leader) submitted it and e-mailed me yesterday with the suprising news! Thanks for visiting and be sure to check out my challenge.